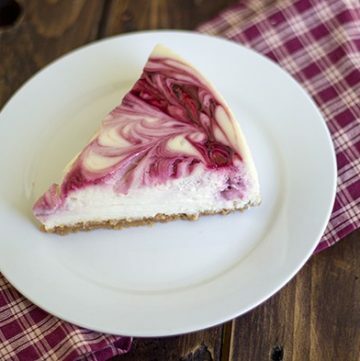 Blackberry cheesecake is creamy vanilla cheesecake with swirls of fresh blackberry sauce, baked onto a cookie crust. This baked cheesecake recipe makes the perfect summer dessert, when blackberries are at their peak. What can I say? It’s one of my favorite berries. I wait all summer long to go pick fresh blackberries. I used them to make a swirled blackberry cheesecake with a golden Oreo cookie crust. So, after creating the blackberry cheesecake recipe, this is what I’ve decided. Cheesecake + Blackberries = Miranda’s slice of heaven. I think the golden Oreos put the icing on the cake.. or the crust on the cheesecake. hahaha. See what I did there? Depending on where you live, blackberries ripen in June through August. They ripen earlier in Southern states, and later in the season in the Midwest and North. The only thing that I can’t stand about blackberries are the seeds. Does anyone else have a deep love for fresh blackberries or raspberries, but can’t deal with crunchy seeds? I know I can’t be the only one. If you’re one of those people, I’ve got you covered. Since I too cannot stand the seeds, I cooked the blackberries and strained them out, leaving a silky smooth blackberry sauce. I’m digging the swirly look of the blackberry cheesecake. I got a little heavy handed on one side of the cheesecake with the blackberry sauce. 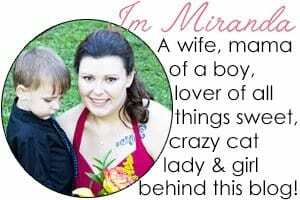 It happens, I suppose. Just go with it like I did, and eat the fully loaded side of the blackberry cheesecake first. It is almost too good to handle. In a medium saucepan, add in the first four ingredients. Over medium heat, cook for about 20 minutes or until the blackberries are completely broken down. Strain out the seeds in the blackberry sauce with a fine mesh strainer. Place back in the saucepan over medium heat. In a small bowl, add in the cornstarch and about 1/4 cup of the strained blackberry sauce. Whisk until combined and there are no lumps. Add the cornstarch mixture into the saucepan with the rest of the blackberry sauce and whisk until combined. Let the sauce come up to a boil and stir constantly. Once the sauce comes up to a boil, let it boil for 1 minute to thicken the sauce. Remove from heat and let cool. Mix the crushed oreos, melted butter, and sugar until it resembles wet sand and can be packed down. Press the crust into an 8 inch spring form pan. Add in the sugar and beat on medium again until light and fluffy. Add in the eggs one at a time until they are all incorporated. Add in the sour cream, heavy cream, lemon, and lemon zest. Beat on medium until the mixture comes together. It will be runny. Pour into the prepared pan on top of the crust. The crust doesn't have to be cooled completely. Pour the blackberry sauce evenly on the cheesecake. 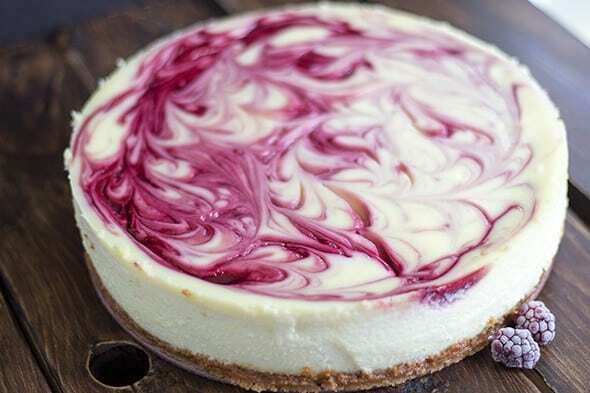 Using a skewer or knife, swirl the sauce into the cheesecake. Place in the oven with a tented piece of tin foil over the top of the cheesecake to prevent browning on the top. Let the cheesecake bake for 1 hour 15 minutes - 1 hour 25 minutes until done. To make sure the cheesecake is done, give it a wiggle. If it slightly jiggles in JUST the middle like jello, then it's done. If it jiggles all over, it needs to bake longer. Turn off the heat and crack the oven door slightly. Let it cool in the oven. I kept mine in the oven for about 4-5 hours and then placed it in the fridge. Beautiful swirling on the top.